This Is Getting Old: Tangradi to Wheeling? And Killeen up to Pittsburgh. No word why. 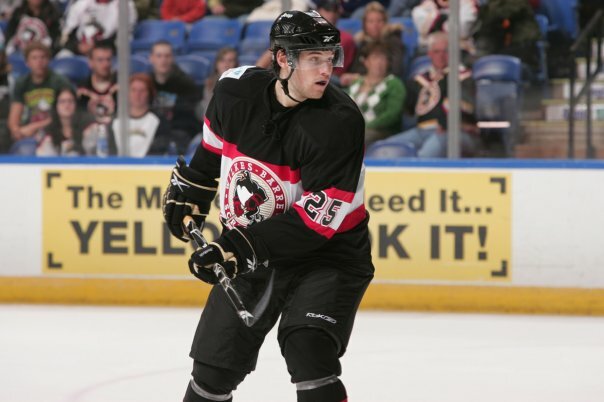 Just hours after being told that he won a spot on Pittsburgh's NHL roster, Eric Tangradi was surprisingly demoted to the Pens' ECHL affiliate Wheeling Nailers. That's right, not AHL, I said ECHL. To replace him, the Pens called up goaltender Patrick Killeen, who is just beginning his first season of professional hockey. To make matters even stranger, nobody from the Pens organization has commented since making the announcement. Now you can probably find just about every rumor in the book on the internet right now, but after pondering this for a while I think I have a reasonable theory. Since Killeen was the choice of replacement, it seems that either Fleury or Johnson suffered some sort of minor injury/sickness during practice today and Pittsburgh is in need of a backup goaltender. Rather than pull someone out of Wilkes-Barre, they figured they would just take Killeen because Wheeling is a much shorter drive and they likely won't need him to do anything anyway. Ok so that half of the story makes sense so far. Instead of sending him to Wilkes Barre, they chose Wheeling mainly because of its close proximity to Pittsburgh in case Tangradi needs to come back on short notice. Now Pittsburgh has 13 forwards already so even if Asham is unable to play, Tyler Kennedy should fit in his spot. But, if someone else gets hurt right before gametime, then the Pens will be in need of another forward and Tangradi will be able to come back up to Pittsburgh without penalty while whoever is injured gets put on the IR. That's just my theory because I find it hard to believe that Tangradi actually will stay in Wheeling unless he really violated team rules of some sort. Hopefully someone will clear this thing up tomorrow. *note: Simon Despres was the final cut (until the Tangradi fiasco) of camp and was assigned back to his juniors team in St Johns.